CFO magazine readers can now vote for their preferred financial software products and service providers. 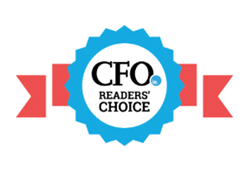 CFO invites its readers to vote in its Readers’ Choice Awards. Now through March 25, CFO magazine readers can vote for their preferred financial software products and service providers, including accounting firms, banks, consulting firms, 401(k) record-keepers, insurers, ERP providers, CRM vendors, and more. Five lucky voters chosen at random will receive a $200 Amazon.com Gift Card. Phase one voting will close on Friday, March 25, at 11:59 p.m. Eastern time. The winners and runners-up will be revealed in the June 2016 issue of CFO magazine. To vote visit ww2.cfo.com/tech/2016/03/cfo-readers-choice-awards-2016/. About CFO Publishing: CFO Publishing LLC, a portfolio company of Seguin Partners, is the leading business-to-business media brand focused on the information needs of senior finance executives. Delivering content through multiple channels including online, digital, mobile, and print, the business consists of CFO magazine, CFO.com, CFO Research Services, CFO Learning, CFO Conferences and Innovation Enterprise. CFO’s award-winning editorial content and loyal, influential audience make it a valued resource for its readers as well as an effective marketing partner for a wide range of blue-chip companies. CFO has long-standing relationships with more than a million finance, technology, analytics and operating executives.